Jonas Salk was born on this day in New York City in 1914 Today is the 98th anniversary of his birth. He was the oldest of three boys born to Russian/Jewish immigrants, Daniel and Dora Salk. He was an excellent student and he attended Townsend Harris High School, a high school for gifted students and a springboard for boys who had the talent but not the money or social connections to get into private colleges. At Townsend Harris he read everything he could find, he studied hard and always got good grades. At 16 he started the College of the City of New York. At first he focused on Law, but he soon changed his mind and decided to study medicine. The flu virus had recently been discovered and Salk worked on a way to “deprived of its ability to infect, while still giving immunity to the illness.” [Academy of Achievement] His work in fighting the flu and in developing vaccines helped prevent a repeat of the flu epidemic like the one that ravished the country in 1919. At Pittsburgh he researched the polio virus (in 1949 it was discovered that there were three types of polio viruses) and he worked on a vaccine that tackled the disease. By 1950 testing began, in 1955 the vaccine was ready for general use. 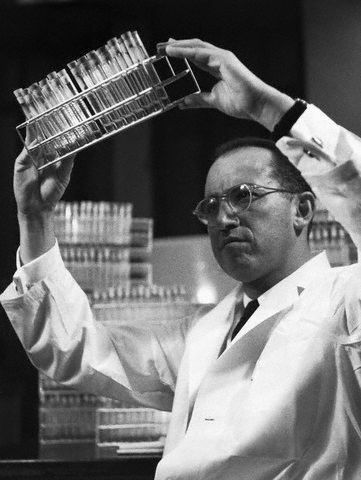 Salk had developed a “killed-virus” vaccine that required three or four injections. 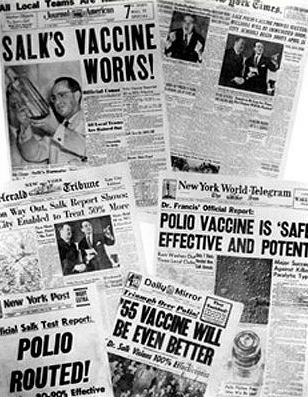 Salk won the Lasker science award in 1956 for his work on Polio. The Salk Institute for Biological Studies, which focused on the autoimmune functions of the body opened in San Diego, California in 1963. While heading up the institute Salk published Man Unfolding (1972), The Survival of the Wisest (1973), World Population and Human Values: A New Reality (1981), and Anatomy of Reality (1983). Towards the end of his life Dr. Salk took up the fight against AIDS and searched for an effective vaccine for the disease. He died at the age of 80 in 1995 in La Jolla, California. This entry was posted on Sunday, October 28th, 2012 at 9:12 pm	and tagged with Jonas Salk, Salk Institute for Biological Studies and posted in American History, Jonas Salk, Medicine, postaday, Thought of the Day, Today's Birthday, Uncategorized. You can follow any responses to this entry through the RSS 2.0 feed.